Cupcakes 'n Daisies: Done Count'n . . . . . . I've really enjoyed working with that Countdown to Christmas fabric by Sweetwater for Moda. I've enjoyed it so much that one quilt, one wallhanging, and three pillows was not enough. Nope, I had to make one more thing, a pincushion. I'm sure hoping Sweetwater has a Christmas fabric for 2012. I keep checking the Moda Coming Soon page, the designers that have their Christmas fabric coming out this summer are listed, but so far, nothing listed for Sweetwater. I think Countdown to Christmas came out in August last year so maybe their next line will be out in August this year. The Coming Soon fabric page at Moda only goes through July. So after one quilt, one wall hanging, three pillows, and one pincushion I still have some fabric left. There's some pieces from a layer cake, some pieces from a charm pack, some yardage and some scraps. I think there's enough fabric here to make something, and they are yours for the asking. If you've been hoping to get to some of this lovely fabric, but haven't gotten around to it, here's your chance. In your comment, let me know what you're working on now or what's up next, I just love to know what folks are working on in their sewing rooms. Do you ever check out the Top Sellers page at the Fat Quarter Shop? It's a nice look into what folks are buying for their sewing rooms. French Vintage by Joe Wood for ThimbleCreek Quilts. Cute, cute pincushion! Your next project is going to be yummy! What a cute pillow! My current projects are some scrappy quilts, Virtue of Necessity by Geoff's Mom Patterns, Ohio Star Crossing by Country Threads, and Quilt Squares #3 by Lori Smith. Scrappy quilts are so much fun to make. I don't have any of the Countdown to Christmas fabric so I would love to win some. The quilt, pillows and wall hanging you made from the fabric look so nice. Thanks so much for sharing for your fabric with someone. I would love to have your scraps. I would love to make a scrappy quilt for Christmas. I have some Reindeer Games to make a Starry Eyes quilt from. 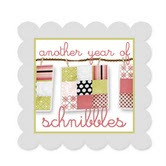 I am working on the latest Schinnibles quilt pattern for February-still trying to pick fabric for it. Ooh...I want my name in the pot...I have been watching your quilt, pillows and now your wonderful pincushion and drooling all over my coffee mat....this little box isn't big enough to list all my projects I have going on...but I am working on 3 twister quilts, the "Quilt Red" project for my LQS and the Thimbleberrie's Pantry Party at my LQS, several embroidery projects, new "adopted grandbaby" coming in May, Pokeno secret pal projects, Garden Club party in May...told you this block was too small...thanks for being so generous. I have admired countdown to Christmas since it first came out, but I never did commit to buying any. And I have NO Christmas quilts, and my tree skirt is over 20 years old. I need to make a new tree skirt. What I'm working on - a secret project for MBS with ''Redwork Renaissance'' :) Loving this line! I'm always surprised at how you and have the same patterns on our to be made list! The difference is that you actually make the patterns you buy while I appear to just collect them! That is an adorable little pincushion...such cute buttons too! As always I am working on too many projects and not making much progress lately. What I want to spend my time on is finishing my Dr. Seuss quilt. I am half way done the machine quilting and can't wait to get back at it. I love this fabric. Right now I am working on Starry Eyed. Your blog gave me the inspiration. I have told everyone about this quilt pattern and the fabric. I sure could use some extra fabric. Thanks for the chance to win. I don't have a blog, so I can't show you my quilt when I get it finished. I'd love to have your scraps. I made a table runner from Countdown to Christmas. I am working on a Spiderman fabric quilt and a truck/car fabric quilt for two great-nephews. They will be 4 years old soon thus fabric choices!! I would love to have some Countdown to Christmas. The projects you have made with it are awesome. Right now I'm working on the Orca Bay mystery from Bonnie Hunter's website. Lovely scraps. I'd love to own them. Right now I'm working on several projects: a quilt for my brother who is retiring from the Air Force this summer, the pattern Elizabeth by Carrie Nelson (for me) and a lap quilt for a friend's mother. Oh goody! I have French Vintage pattern and it is on my to-do list to make from Etchings line. I'm looking forward to seeing what you do with it. Generous of you to offer the fabric but don't include me in the drawing as I am drowning in stash here! I can't wait to see what your French Vintage will look like. I'm getting ready to work on Christmas quilts for my children - one for each of the four. I'm starting now, and hoping to have them well out of the way before the holidays. Hope springs eternal! Actually I'm still working on "Count Down To Christmas" pattern using that fabric. I also want to make a tree skirt out of it. I'm working on my guild's mystery quilt. It is supposed to be just two colors plus a background fabric but I'm making mine scrappy. I love scrap quilts. Why use two colors when you can use twenty? Oh how I love Countdown to Christmas fabric. I bought so much I almost had to get a second job. I have yet to have time to make anything with it, but a quilt, tree skirt and pillows will be ready for next Christmas. Right now I am working on a 25th wedding anniversary quilt for a dear friend, party is this coming Saturday. I love this pattern I'll have to check it out for Y seams, don't like y seams. Oh please pick me! I am still waiting on my Schnibbles patterns to arrive, but I want to make the Neighbourhood pillows and table toppers that everyone is doing. I have my charm packs but need so more fabric to complete this project and I would be thrilled to have your "scraps"
I am working on my sister's 60th birthday quilt. It is a pattern from an old AQP Sampler magazine. I also have two Christmas quilts for my granddaughters on the list this year. They have outgrown their "little" ones. Thanks for the chance to win. Thelma you are incredible--you get so much accomplished! (and I mean actually finished!) I started another hand applique quilt recently (which means another unfinished project most likely), but it was too cute to resist--Raining Cats and Dogs by Bunnyhill. Would love to have your scraps. My sister wants me to make her a tree skirt--they'd work perfectly for that! I read your blog every day, You inspire me ... and I love all the quilts that you make your "own" I bought the countdown to christmas and gave it to my quilting mentor for Chrismtas.. I am working on a buckeye beauty (found leftovers)I would love to gain your scraps.. thanks for the chance. Wow.. great leftovers! That is such a pretty line. I'm working on too many projects to list - but it includes two quilts needing binding, a Brick & Stepping Stones quilt from Quiltville, a quilt from the Scrapbasket Sensations book, and a modified Bento Box quilt. I love your pincushion! These fabrics are amazing and I'd love to try using it on some Christmas project. I'm currently working on a Swoon quilt for my sister. I hope to have it ready for Christmas 2012. I love the countdown to Christmas line! and I have really enjoyed watching you create with it. Next on my project list is some shirt quilts. I have 6 to make, three tops are done and I have three more to go. I am hoping to have them all done by April. I recently picked up the French Vintage pattern too. But currently I am working on a Country Threads pattern called Farmer's Daughter using Minnick & Simpson's Clermont Farms fabric. I really enjoy your blog and admiring all your beautiful work! I love this Countdown line - I've been debating on whether to buy a few charm packs to make some more houses - great giveaway! Love your cute pincushion. I am currently working on the Feb Schnibbles and a Miss Rosie quilt called Lincoln out of French General fabrics. I'm trying to get them both completed this month! I just bought the French Vintage pattern - what are you going to make yours out of? This is a beautiful pattern. Can't wait to see what you've got in store for it! Love this fabric and what you have created with it! I'm working on a round table cloth out of 3 Sisters Oasis and a quilt out of Strawberry Fields that I found on Moda Bake Shop. Then there are all the quilts waiting to be quilted...I love the French Vintage pattern! 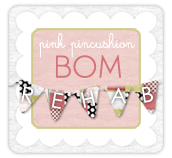 Love the pincushion! I made a Schnibbles quilt with Countdown to Christmas and if I won, I would add your scraps to mine and maybe have enough to make another Schnibbles. Thank you! I just finished putting borders on a quilt last night using the pattern Just Can't Cut It (wonderful, quick quilt), using Iowa Hawkeye fabric and blacks and golds. I plan on giving it to a 4th grade boy who is fighing cancer for the second time and is a big Hawkeye fan. I am quilting it with black Minky fabric for the backing. It will sure to be soft and cuddly for those down days after his treatments. I am working on Just Takes 2, Ann Sutton's Dresden Plates, and a mystery quilt by Sherri falls. I am working on my Calendar girls red work stitchery quilt blocks, Just takes 2 and just starting cutting my fabrics for 45 & Life To Go . LOve your pincushion ! WOW! You really got a lot of mileage out of your Countdown to Christmas fabrics! The final project..the pincushion..was just the right finishing touch with the cute buttons. I am currently working on a wall hanging for my sewing room, made with Kansas Trouble fabrics. We haven't been in our home very long and my sewing room walls are still bare but hopefully not for much longer :o) Thank you for the generous offer of your Countdown to Christmas fabrics! I am trying to get the machine quilting finished on at least one baby quilt this week! Wouldn't it be grand if I could get two finished?!?!! Love your pincushion - the buttons are really cute! I'm looking forward to seeing what fabric you pick for your French Vintage quilt! I love the Countdown to Christmas line and did get a few fat quarters for some Christmas projects...those and your give away fabrics would work well with my Christmas quilt idea! I am currently Swooning away, one block a week, working on a Fig Tree quilt pattern (being obsessive compulsive about matching points), and Sparkle BLocks for another online quilt along. I'm working on a 9-patch mixed with applique baby quilt for our church quilt ministry. Thanks for the giveaway! What fun fabric! Now that I have grandchildren, I want to make each of them a special Christmas quilt so this would be a fun start. Right now I am working on "Scrappy Nines", a quilt from Spotlight on Neutrals by Pat Wys. It is to be a wedding gift for one of my daughter's friends. I agree - Countdown to Christmas was a great line. I'm looking forward (already) to Blitzen by BasicGrey. Currently I'm working on a quilt from Grace (3 Sisters Christmas, but doesn't look like Christmas) and a red and yellow quilt, also using 3 Sisters fabrics, mostly from Vienna Nights. Lots more planned, of course. I am working on a sail boat quilt for my 6 year old grandson. Next will be a lighthouse quilt for his 11year old brother. Thinking ahead to christmas 2012. I was not sure about Countdown to Christmas until I was able to see a few "real" samples - living in Europe didn't help either because by then it was hard to get it in the U.S. and it still is over here!!! In the meantime I was able to gather a few pieces here and there but by far not enough variety for the project I have in mind for it ... "Stars Over Fort Sumter" by Paula Barnes, and Carrie's House Pillow would be a nice bonus. You see I would be ever so happy and grateful to win your leftovers. At the moment I'm handquilting a friendship star quilt made with fabrics from a scrap exchange, piecing "Playmates" by Pam Lintott and my next start will hopefully be "Merry, Merry Snowmen" by Bunny Hill. I love that fabric, and missed out on it. I would love to be the winner of this giveaway - thanks for doing it! I just love your quilts - thanks for sharing them with us too! I bought a layer cake in November and have been collecting more as I can find it. I would love to add your overage to my stash. I am thinking about Plan C, a schnibbles pattern. I've been kicking myself for not buying some Countdown to Christmas last fall when it was available. I really want to make a lumbar pillow like Carrie had on her blog. I even bought the pillow form already! Now I just need some Countdown to Christmas!Thanks for the giveaway chance. I always enjoy seeing all the beautiful quilts you make. How funny! I have that pattern from Joe Wood, he owns the LQS here in Concord...his patterns are fabulous and so is he :) I'm working on Island Chain right now from ScrapBasket Sensations, its coming together really quickly and I think I may have my first 2012 finish :) Plus, bonus is I'm using fabric I bought in 2012. Thanks for the chance to win! I would love to be able to use your leftover Countdown fabric. I have fallen in love with several of the projects made with this fabric. Since tomorrow is my birthday, it would be even more special! I am just starting on a graduation quilt using the Starry Eyed pattern from the Moda Bake Shop. Thanks for such an inspring blog. Always enjoy it. Who doesn't need a Christmas pincushion? You need one for every season and holiday! As for me, I'm working on a million things right now, but my two biggest projects are a Dresden plate quilt for my bed made with Pam Kitty Morning fabric and I got hooked on those granny square blocks you see all over the place right now. I've got ten done - at least ten more to go! Your next project will be just lovely - can't wait to see it! I love your blog. I read it when I need inspiration! I am working on an appliqué quilt called "Benji's Pockets" that I fell in love with on a recent excursion to Piper's Quilts in Salt Lake City. I always choose some new shop to explore on road trips with my DH. My GS, Zach is expected in May! The nursery is red, white, cream, grey and black. Different, but stunning. My daughter's favorite color is red! Hi Thelma. I have just finished making a darling Valentine's Day pennant, and am in the final stages of a baby quilt made from Wanna Be a Cowboy 2 (with a cowboy Minky backing.) My next project will be with French General fabrics, which I have been collecting for awhile. I've been looking for the perfect pattern, one that has pieces large enough to show off the beautiful fabrics. I think that I've decided on On a Whim by Camille Roskelley, who designed Swoon. I'm very excited to get started! Thanks for your marvelous blog - I enjoy reading every new post, love your photographs, and have learned a lot from the blog. I'm in the process of finishing of it's a girl quilt, lollipop lemonade, love love love the cushions and the finished starry eyed quilt. I'm ready to quilt a baby quilt that is yellow and white on the front and is backed with Kitty Cucumber fabric. I am also making a "woodworking" quilt for my Dad for his birthday. I love all of your Countdown to Christmas projects and would love to win your fabric leftovers! Right now I'm working on a Miss Rosie Lumiere de McGuffey quilt and a Pattern Basket Confetti Cake quilt. Thanks for the fun giveaway. Happy Valentine's Day! What a great opportunity to win this fabulous selection of fabric :) I am in the middle of King's Corner by Monique Dillard which was a mystery quilt at a quilt retreat I attended with my sister at the weekend. Stayed with an awesome teacher and had great fun. Thanks for sharing your work and experience. Fingers crossed...! Reunion and wait for the Christmas group.